Ben needed a quick lunch and I am a firm believer that one cute item can totally spruce up the meal. The car is a cookie cutter, the wheels are a separate one (actually, just a plain circle fondant cutter). The car cutter leaves a window impression without a cut out, so a sharp knife fixes that, just follow the lines. The simple little car took maybe a minute extra to make, but totally makes the box! Ben has a turkey sandwich on Nature's Own Multigrain Sandwich Rounds with onion/chive cream cheese, topped with the little car (white cheese is swiss, orange is cheddar). A few pretzel grids hold it in place. 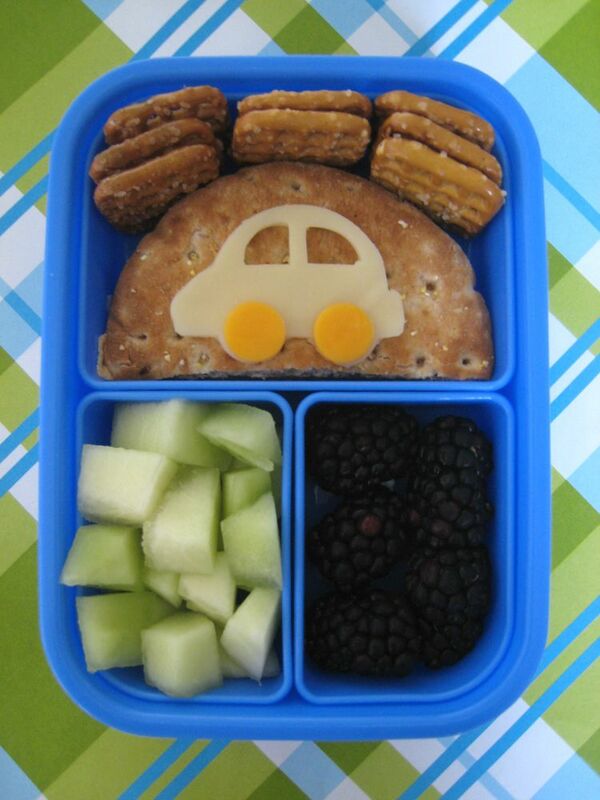 The other compartments hold honeydew and blackberries, two of Ben's favorites. It's packed in my Paperchase Alien box which is a favorite of mine. I'd love a girly version for Faith! I love your ideas,so cute! !